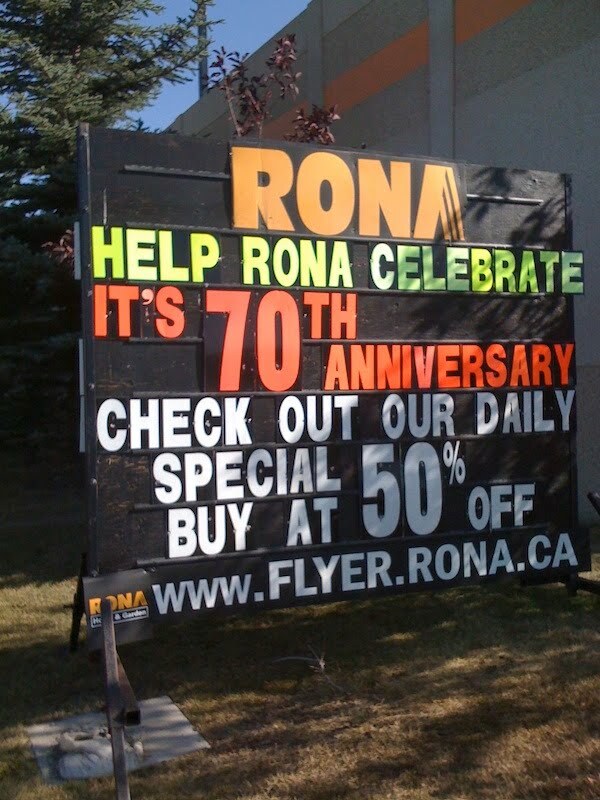 Help Celebrate It Is 70th Anniversary! Hello there! This isn’t a terribly exciting submission, but it made me grin when I saw it several weeks ago, at least. Hence, I thought I would send it your way. 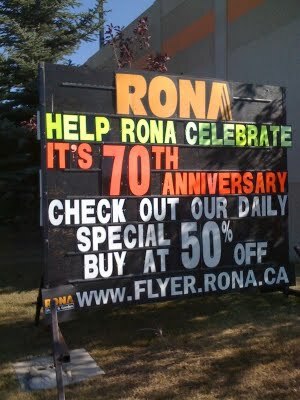 This is a signboard outside a Rona in Calgary, Alberta, Canada. An an Englishman and grammar pedant, I can confirm that that's not true, Jamie. There is no possessive apostrophe in the Queen's English. She wouldn't be seen dead with one. Hmm on this one we have to be careful. I know in the Queen's English, using the apostrophe in the possessive of "it" is actually correct. This is from Canada, and I'm not sure if they use British grammar or American English grammar. On reflection. I'm just being stupid. It is wrong, and therefore my previous statement is wrong. And now, I have to go and put my head in boiling oil for my crime. I'm pretty sure that this sign is right. It's using the possessive apostrophe. Although after looking at so much apostrophe abuse it becomes hard to tell when to use one and when not to.